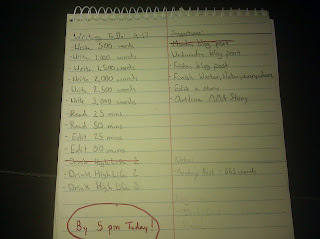 I’m not sure there is anything quite as intimidating in writing as a deadline. It is a mysterious and brutal force that holds us accountable to ourselves, our clients, and our craft. If abided by, deadlines can demolish our preconceived limitations and progress our writing abilities. I’ve read lately about writers hating deadlines, citing that it stifles creativity. Others simply seem to fold under the pressure of accountability. I used to be like that. It took me more than a year of writing sporadically to realize it, but deadline hate is merely an excuse of delineates and hobbyists. Without deadlines, either set by ourselves or others, very few of us would have the discipline to finish a project. Committing to a piece of writing, especially one of novel length becomes a strange pipe dream; projects we tell our friends about but rarely sit down to work on. Last month, when I did my writing challenge, I was faced with word counts I had never reached before. For multiple days I had to break word counts that I had never hit before, or accept the consequences of missing my deadline. I never thought I was capable of a seven thousand word day, much less two in a row. I had never broken five thousand, and on the last day I busted out 9,000 words. Was it the prettiest prose of my short career? Probably not, but I do have a wicked stack of work in front of me. Would it have been better for me to have just done the work on a daily basis? Of course, but procrastination got the better of me, as did work. Instead of simply giving up, I put in the time, and learned what I am really capable of. In physics and in writing, the work in is equal to the work out. There is no easy way to get better, only faster ways. If we work our asses off to attain our goals and do so in a regimented manner, then success will come. It may not always be in the form of a bestseller, but your body of work will speak for itself.